A visit to Australia is like embarking on an exploration of a treasure chest; the country is simply so rich in art, culture, fine food, breathtaking scenery and soul-fulfilling adventures. 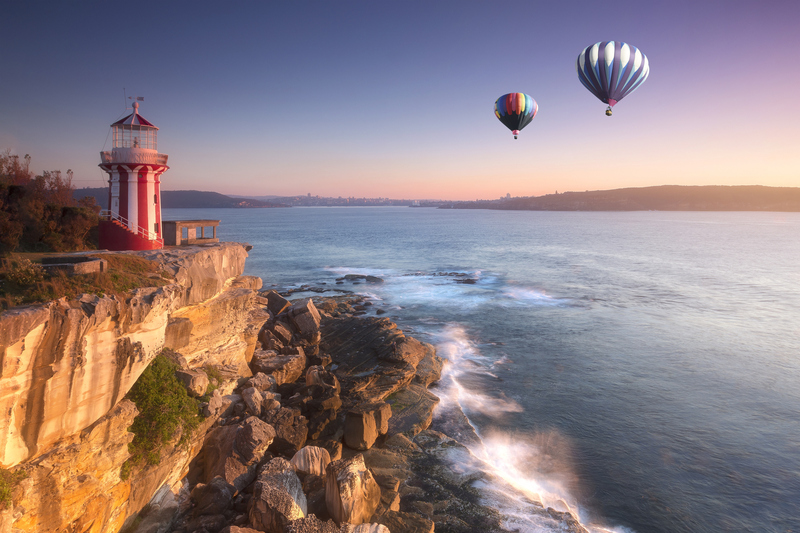 From beautiful beaches, long coastal walks, hot air balloon rides and expertly curated coffee tours to galleries, farmers markets and the opera, a trip to Australia certainly won’t leave you stifled for choice. With Thai Airways’ promotional one-way fare to Australia of 11,905 Baht, it’s never been easier or more enticing to enjoy all the riches the country has to offer. We look at Sydney, Melbourne, Brisbane and Perth for inspiration towards our next travel destination. Sydney is the capital of New South Wales and is also one of Australia’s largest and most happening cities. Many would argue that Sydney should indeed be the capital, as it’s rich in Australian culture and filled with plenty to do, yet Australians from the other big cities may not agree with this one! You probably have seen the iconic harbourfront Sydney Opera House numerous times on postcards and travel dossiers, with those distinctive sails set against the Sydney skyline which unsurprisingly make it one of the 20th century’s most famous buildings. Thus, a trip to Sydney would definitely be incomplete without a trip to this multi-venue performing arts centre, which has seen the likes of Nelson Mandela, Michael Buble and Oprah Winfrey making appearances here. Perhaps consider doing the Sydney Opera House backstage tour, as this will allow you access to areas normally reserved for stars and their entourages. Eating gorgeous food is always a must and you’ll find the restaurants in Sydney – and Australia – are among some of the best in the world. The list of places to eat is extensive, but a few recommendations are Ester Restaurant; Hubert; Momofuku Seiobo and of course, the Thai-inspired Long Chim! Another great way to experience the city is by going on a climb to the top of the Sydney Harbour Bridge; with the Sydney Harbour Bridge Climb, we recommend you take the express option as this will be less taxing on your legs – but by all means take the longer and harder route if you are keen! Daytime is beautiful, but nighttime is even more stunning. We do recommend you go at night, as the view is that much more magnificent, giving you 360 degrees of a Sydney that will be unforgettable. If you take the Manly to Spit coastal walk, you’ll definitely see the true character and different depths of the city; the path will take you past indigenous rock art, several secret beaches and quite a few millionaire mansions and architectural masterpieces. If you get the chance, do make a point of riding a hot air balloon through Camden Valley. With a 4am start from the Rydges Hotel – maybe consider staying there the night before – with Balloon Aloft Camden, you’ll get a spectacular view of the sun rising in the east with beautiful pink tones and long shadows hitting the countryside below, from the beautiful church steeples of Camden to the hills of the Razorback Ranges. Don’t just leave it to your Thai Airways flight to show you how beautiful Sydney looks from the sky! For real thrill-seekers wanting to see the sights by sky, we also recommend skydiving, which is a very popular and safe activity in Sydney, with highly trained experts to guide you every step of the way. If you’re going to try skydiving once in your life, you may as well do it Sydney, where it’s safe, companies are held accountable, and it’s beautiful. A trip to Sydney also wouldn’t be complete without a visit to Chippendale, a happening area known for its cutting-edge creative scene and of course, converted hipster warehouses. Walk through shops and eateries by the sleek Central Park Mall or picnic like a local on the picturesque Chippendale Green. Contemporary galleries are all the rage in this area, and a visit would be incomplete without heading to White Rabbit Gallery which specialises in 21st century Chinese art. There’s plenty to do and see at Taronga Zoo, but probably nothing you haven’t seen before in Thailand, from komodo dragons to elephants. But, if you haven’t seen a koala or a kangaroo before, we recommend you go. The Royal Botanical Gardens Sydney is special but somewhat overdone, as in, everyone goes there; why not try Wendy’s Secret Garden? This is a private and intriguing oasis that provides a moment to blissfully get away and is filled with native plants, exotic herbs, towering fig trees, kookaburras and owls; there’s a whole story behind how Wendy’s garden came into being, so be sure to find out. Horse riding is an option too if you’re keen to put on your riding boots during your stay in Sydney. If you’re heading to Sydney, we recommend a stay at The Park Hyatt Sydney, a goregous harbourside hotel with unrivalled views of the Sydney Opera House, and nestled in the historic neighbourhood of the Rocks. Stay a stroll away from the Museum of Contemporary Art, cobbled laneways, art galleries, vibrant village markets, and more, to make your experience of the city that much richer. The city that has four seasons in one day never gets old, and it’s no wonder why Melbourne has been so popular over the years with Thais who choose to study there. Because even when it rains, the sunshine and lovely breeze that follows just makes it so worth it! T-shirt weather, but with colourful scarfs and gorgeous long boots, it’s the best of both worlds really, as in, East and West. Melbourne is the coastal capital of the southeastern Australian state of Victoria. At the city’s centre is the modern Federation Square development that’s filled with plazas, bars, and restaurants by the Yarra River. In the Southbank area, the Melbourne Arts Precinct is the site of the Arts Centre Melbourne – a performing arts complex – and the National Gallery of Victoria, with a wide ranging display of beautiful indigenous aboriginal and Australian art. Melbourne has an exciting and eccentric mix of style, sport, culture and dining experiences, which means you’ll never want to leave, and some never do! One of its real attractions, if you’re into coffee, is that it’s been dubbed Australia’s coffee capital. We’ll leave the hunt for Melbourne’s best cuppa’ joe to you as it’s nearly impossible to find a bad roast here. Coffee is such a fundamental part of the Melbourne lifestyle that the city even hosts an annual Coffee Expo where almost 10,000 café owners, roasters, baristas, equipment manufacturers and more flock to connect and share their passion for coffee. Okay, if you really want the name of a coffee shop, we recommend heading to Auction Rooms and getting your hands on a Piccolo Latte. Bangkok’s very own local coffee shop, Rocket Coffeebar, was in many ways inspired by the coffee culture in Melbourne so if you’re into the vibes at Rocket Coffeebar, you’ll love Melbourne, and if you’re really into coffee, get yourself booked on a Melbourne Coffee Tour pronto! So why is Melbourne seen as Australia’s and the world’s sporting capital? The venues that are home to the city are simply legendary. From March until September, lovers of football can head to the Melbourne Cricket Ground (MCG) ­for the Australian Football league and see how footballers really get down, Down Under. Why they hold it in the cricket grounds is a mystery to us, but hey, when you gotta play, you gotta play! Sporting and horsing enthusiasts have also got the wonderful Melbourne Cup to look forward to, held on the first Tuesday in November; ladies, get your gorgeous hats and cocktail outfits ready. And if you’re into fast cars, well… you’ve got the Australian Grand Prix to look forward to next month on March 25 2018. For a full list of Melbourne’s sports events, click here. Another must-do: embark on a ride aboard the Puffing Billy Steam Railway, Australia’s oldest steam railway and one of the finest preserved steam railways in the world. You’ll be travelling 24 kilometres through incredibly tall eucalyptus trees, beautiful forests and fern gullies of the Dandenong Ranges from Belgrave. Puffing Billy is the last of the experimental narrow-gauge railway lines that was built at the turn of the 20th century, and easily accessible by public transport from Melbourne. Melbourne wouldn’t be Melbourne without sipping some cocktails at a rooftop bar. These high-altitude bars allow you to watch the sun set with a drink in hand, a pastime in itself that need not be justified. Local favourites include the spectacular rooftop terrace at Naked in the Sky in Fitzroy, Rooftop Bar gracing Curtin House in the city centre, and nearby, the very unique Madame Brussels. Have fun! If you’re heading to Melbourne, we recommend a stay at The InterContinental Melbourne, an architectural masterpiece filled with heritage, utmost style and elegance. This stunning 253-room luxury Melbourne property features a Venetian Gothic façade while the modern interior translates the building into the 21st century. Located on Collins Street in the heart of the CBD, you’ll be able to experience everything Melbourne has to offer in the flash on an instant. Some will say Brisbane is boring but they probably haven’t seen all the city has to offer. Yes, it isn’t Sydney or Melbourne, but Brisbane does have its own unique charm about it, and on some days, it may even feel like you’re in downtown Los Angeles! Brisbane, the capital of Queensland, is a large city on the Brisbane River. And any trip to Brisbane would be incomplete without a lunchtime cruise or boat tour down the river. Journeying down the Brisbane River is a great way to see the city from an alternative angle; from the city skyline, Story Bridge and the Southbank Parklands and more, all in slow-moving comfort. Other cruises head out to the ocean for trips to nearby island paradise Tangalooma, or to the waters of Moreton Bay during whale watching season, allowing viewers to see the gentle giants of the ocean up close. Take a paddle steamer and enjoy some live music, feast on some lunch on the Brisbane River, or combine a cruise with another Brisbane attraction – the choice is yours! Look here for Brisbane cruises. Clustered in Brisbane’s South Bank cultural precinct are the Queensland Museum and Sciencentre, with noted interactive exhibitions and displays and talks that will have you understanding our rather perplexing galaxy much better. Another South Bank cultural institution is Queensland Gallery of Modern Art, among Australia’s major contemporary art museums. Looming over the city is Mt. Coot-tha, the site of Brisbane Botanic Gardens and a great place to grab a spot of lunch while sitting in awe at the breathtaking views of the city below. On nights out in Brisbane, we highly just recommend looking up to the sky and being astonished by all the stars you see; pollution in Brisbane is kept to a real minimum, which means the true depth and beauty of the sky really does shine at night. If you’re heading to Brisbane, we recommend a stay at Sofitel Brisbane Central. As the only luxury, French inspired 5-star hotel in Brisbane city, Sofitel Brisbane Central is renowned for its modern and elegant ambience, international cuisine served at four bars and restaurants, 433 elegant rooms and suites and an exclusive Club Lounge that is the largest in Queensland. Perth is the capital of Western Australia and is known for its lively bars and breathtaking beaches, sitting where the Swan River meets the southwest coast. Being a true beach city, sandy beaches line its suburbs and the large riverside Kings Park and Botanic Garden on Mt. Eliza offer stunning views of the lively city. A trip to Perth certainly does entail a visit to Cottesloe Beach, which is filled with plenty to do and see in the way of cafés and Norfolk pines, Mettams Pool for its snorkelling reef, Leighton Beach for its blindingly white sand and rip-free waters, Trigg Beach for its family-friendly grass area and huge playground, and North Beach for its charming rock pools. Every March, the beachside exhibition Sculpture By The Sea transforms the shores of Cottesloe into an art gallery. Don’t forget to visit Perth’s long coast, where pale sand meets turquoise waters so transparent you can see your beautifully painted toenails, no matter how deep you swim. Right in the heart of Perth sits Kings Park and Botanic Garden, one of the biggest city parks in the world – astonishingly, it’s even bigger than Central Park in New York. Here you’ll get extraordinary views of the Swan and Canning rivers as well as the high skyscrapers that are so representative of Perth city life. If Melbourne is the coffee capital, perhaps Perth might just be the bar capital. A trendy bar movement in Perth is incredibly vibrant, and has brought in the likes of stunning street murals that are often seen on the outer walls of Perth’s bars. If there’s one we’d recommend, it’s the classic speakeasy bar, Sneaky Tony’s; to get in, you have to whisper a password. The password changes daily; head to their Facebook page and message them for the password when you’re in town! If you’re heading to Perth, we recommend a stay at Como The Treasury, a 48-room contemporary luxury hotel in Perth’s newly revitalised historic heart. Occupying state buildings dating from the mid-19th ­century, COMO The Treasury opens up the city with new experiences by way of two restaurants, a bar and world­ renowned COMO Shambhala wellness therapies. Designed by Kerry Hill, COMO The Treasury also provides an elegant, restful base from which to explore the wilder lures of Western Australia. Thai Airways offers direct flights from Bangkok to Sydney, Melbourne, Brisbane and Perth. All inclusive one way starting fromTHB 11,905. Head over to thaiairways.com or call the THAI Contact Center on 02-356-1111 to secure your ticket today.